The Samsung Galaxy Tab 10.1 has been tantalizing us for some time now and still we must wait. We’ve seen it pop up in Russia and there’s word of its release in India. Pricing and spec sheets are floating around the internet and still we must wait! The good news is that June should see the worldwide launch of the Galaxy Tab 10.1. Samsung have kept schtum thus far on an official global release dates but in specific regions, days and months have already been hinted at and if it’s available in one region, it’s release elsewhere won’t be far off. Of course if you’re a Google or Android developer who was lucky enough to attend Google I/O this year, you already have a special white-backed, android-covered 10.1 sitting somewhere in your office and for that I admit I am jealous. With regards to the rest of us mortals however, we’re just going to have to wait and see when Sammy decide to pop the cork. Speaking of release dates, in lieu of the 10.1′s eventual arrival, Samsung Germany have come across all eager. 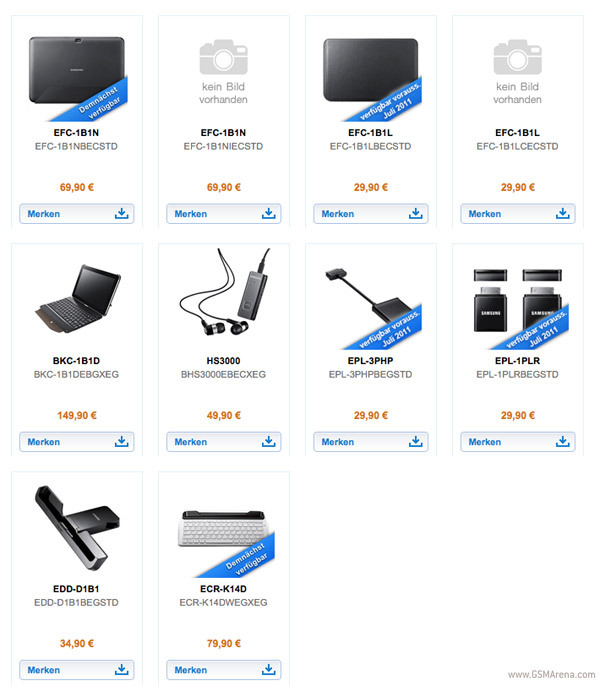 There are a host of accessories from about €30 to €150 available for purchase at this very moment, from the Samsung Germany website. The current list of 10 items include typical accessories such as a protective hard shell-case, a headset and various USB adapters (stated as unavailable until July). The cream of the crop though, has to be the case that comes complete with an integrated Bluetooth keyboard. As well as looking pretty good by itself, this special case would give the Galaxy Tab 10.1 a real competitive edge against a fellow tablet such as the Asus Eee Pad Transformer. There are other items too, like a keyboard dock, but this simply says “available soon” so it’s anyone’s guess when that will become available. What all this does mean, besides the fact that you can now start decking out your Galaxy Tab setup before you even own one, is that the actual device this is all for, might actually arrive in retail in the near, near future. Fingers crossed anyway.